Berkeley - Five faculty members at the University of California, Berkeley, joined the campus's elite ranks of teaching excellence on April 30 when they were presented with the 2002 Distinguished Teaching Award. The award is the highest honor for instruction given by UC Berkeley. Only five percent of those who have taught at the campus since 1959 - when the awards began - have received this award. This year's recipients bring the total to 207. This year's awardees are Tyrone Hayes, associate professor of integrative biology; Usha Jain, a senior lecturer of Hindi language and literature; Jeffrey Knapp, associate professor of English; Leslie Kurke, associate professor of classics and comparative literature; and Stephen Welter, professor and division chair of insect biology. "People automatically think of UC Berkeley as a premier research institution, but what too often gets overlooked is the incredible dedication and prowess of our faculty as teachers," said Richard Kern, chair of the award selection committee and associate professor of French. "The Distinguished Teaching Award allows us to publicly acknowledge the importance of teaching at Berkeley, and the high teaching caliber of our faculty, by celebrating the talents of a few of our very best each spring." Tyrone Hayes is not afraid to bring his personal life into the classroom. "Biology is the study of life," he tells his students, and what better way to illustrate life than with examples from his own. So, students view his children's fetal ultrasounds when the class on human endocrinology focuses on fetal development. They learn about water retention by discussing his children's response to camping in the desert. Whether it's tales of expeditions into African swamps or polluted Midwestern ponds, Hayes' goal is always to illustrate the important role hormones play in our daily lives. "Through his stories, Tyrone takes students in the classroom on his journeys to Africa, a local pond, and camping with his family in a desert," said colleague Robert Full, professor of integrative biology and a Distinguished Teacher himself. "He engages the hearts and minds of students like no other teacher I have ever witnessed." Hayes' openness encourages personal interaction from his students, and their questions often steer the course in new directions. During one office hour, three women undergraduates came in to ask why aspirin relieves menstrual cramps, making him realize that a monthly event important to half the student population is barely discussed in endocrinology courses. 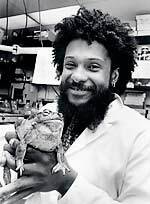 "The openness of these students made me realize this shortcoming, and now the topic has become part of my syllabus," said Hayes, a developmental endocrinologist who specializes in amphibians. "This would not have emerged without the personal relationships that I develop with students." These bonds also are reflected in the fact that about 10 undergraduates work in his lab each year, learning how to do research at the level of a graduate student or post-doctoral fellow. "I have never met a teacher as unselfish with his time, wisdom, and experience as Tyrone," said Vineet R. Jindal, a former undergraduate and graduate student in Hayes' lab who now works for Lehman Brothers. Hayes' teaching techniques, which let students "rediscover" information through study of the history of a topic and the design of experiments to test theories, convey the importance of both teaching and research. Discussion of real-world examples - the ethics of using growth hormones to speed weight-gain in beef cattle, or the genetic reason why twins often run in families - both engage students and convey the relevance of the course material. "Fortunately, I had many good teachers, and what I remember most is that they loved their jobs and that they lived to watch students get excited about science," he said. "My goal is to make my students as excited as my professors made me." 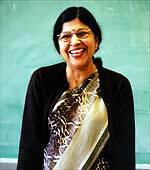 Usha Jain has taught Hindi, the national language of India, at UC Berkeley since 1971. Her position was supposed to be temporary but, given her skills in the classroom, it quickly turned into an ongoing assignment. "It has been gratifying to teach and to share my culture," Jain said. "The students are so great, the rewards are so instant; what they learn is immediately visible in their eyes." Over the decades, Jain has continued to experiment with new classroom tools and materials, writing and developing textbooks and a CD-ROM - items widely used in the United States and Europe. In the classroom, she uses slides, films and discussion of contemporary issues to provide cultural context to the language. Jain creates an environment in which students quickly gain confidence in using the language. For example, at the intermediate and advanced levels, she engages students in discussions on issues prominent within India and throughout the world. "By using their intellectual faculties to focus on relevant social issues, they are almost able to 'forget' that they are speaking in Hindi," Jain said. Numerous students and colleagues note her compassion for her students as well as her demand for excellence. "I remember spending hours on my essays for her class to earn that much desired 'shabash,' (excellent)," recalled former student Sujata Mody. "It was in her classroom, and through her encouragement, that I developed confidence in my ability to communicate in Hindi and gained access to a literature that I grow to love more and more everyday." "Several generations of South Asians and South Asianists have gone through the rigorous training in language, thinking, community work and commitment that she has offered," said Dalmia. "Her classroom discussions, apart from being intellectually stimulating, have all along reflected her engagement and concern with urgent contemporary issues." Jeffrey Knapp said when he began to view the material he was teaching through his students' eyes, he rediscovered his own joy in literature and evolved into an even more enthusiastic and effective teacher. "To analyze a pun of Hamlet's, for instance, I would first have to consider why a man so grief-stricken by the death of his father would bother to joke at all. The next time I taught Hamlet, I posed this very question to my students, and the play seemed to unfold for us," he said. Knapp, a former chair of the English Department who teaches Shakespeare, Renaissance and British literature, recently finished a book, "Shakespeare's Tribe: Church, Nation and Theater in Renaissance England," and is working on a project about Renaissance poet Edward Spenser. Having had the spring 2002 semester off to work on his research, he said he's excited about returning in the fall to the classroom. Blakey Vermeule, an assistant professor of English at Northwestern University, summed up what makes Knapp so good: "He simply has better and more interesting ideas than most people do." Joseph Ring, a graduate student and teaching assistant in Knapp's "Chaucer through Milton" course last fall, was wowed by what he observed. "While he reassured us shocked 'TAs' that he does, in fact, use notes during his lectures, this fact is nearly undetectable," Ring said. "I was continually astonished and amazed throughout. " Knapp is humble about his teaching. "I advise students how to analyze literary genres and traditions as well as individual texts, how to formulate arguments, how to research and write papers, how to study for examinations, how to submit essays for publication or talks for conferences, how to prepare for job interviews, how to become teachers themselves," he said. "Each of these tasks requires different skills in the teacher as well as different modes of address to students, and I grew convinced that the more I took such differences seriously, the more effective a teacher I would become." Knapp, who received his BA and PhD in English from UC Berkeley, recalled having "one amazing teacher in the English Department after another." From the moment professor Leslie Kurke stepped into her first lecture course at UC Berkeley in 1990, she knew the students - diverse, intellectually engaged and highly motivated - were unlike any she had known. Her students have returned the compliment with the Distinguished Teaching Award. One of UC Berkeley's MacArthur Fellows, Kurke holds joint appointments in classics and comparative literature and is known for her fresh, interdisciplinary approach. Her specialties span archaic and classical Greek literature and cultural history, with emphasis on archaic Greek poetry. Kurke "has the great gift of presenting new and difficult ideas to students in a fashion that allows a student to feel that he or she has discovered this startlingly brilliant idea on his or her own," said Emma Dewald, a former student of Kurke's. English professor Sharon Marcus, who co-taught with Kurke a fall 2000 course on the history of sexuality, recalled "being dazzled by her erudition, her mastery of Greek texts, of anthropological approaches to antiquity, and of contemporary reading practices and theories of culture." And Robert Knapp, chair of the Classics Department, said that, as he watched Kurke in the seminar, "I witnessed a master teacher at work." "In my experience, students at every level are exhilarated by the presentation of clear and complex ideas; they respond by reading and talking more, thinking harder, and writing better than they themselves perhaps thought they could," said Kurke. Kurke began teaching at UC Berkeley in 1990 and has team-taught courses pairing ancient Greek material with ancient Hebrew, ancient Chinese, and Renaissance and Victorian systems of gender and sexuality. She has served as editor of the journal Classical Antiquity and has taught a course on "Psychoanalysis and Detective Fiction." Her latest book is "Coins, Bodies, Games, and Gold: The Politics of Meaning in Archaic Greece." With her MacArthur grant, she is writing a book using Aesop to recreate what Greek popular culture might have looked like. Having dreamed as a child of a career in medicine, Kurke said she was in college when the idea of becoming an academic took hold. "In teaching, the world never stands still," she said. It would not surprise most people to hear Stephen Welter say, "Insects are amazingly cool." He is, after all, the professor and chair of the Division of Insect Biology in the Department of Environmental Science, Policy & Management. But it is Welter's knack for instilling in students the same passion he holds for insects and the environment that has earned him accolades from students and colleagues alike. "It's not really about getting students to understand the role insects play in our lives," said Welter. "It's more about helping them to appreciate the wonders of ecology and to become better stewards of the environment." Students who have taken Welter's Environmental Issues class say he is particularly adept at conveying the political, social and scientific complexities inherent in protecting the environment. Former student Ja-Ming Emily Lee said Welter taught students that "the 'right' thing to do is often harder to find when we start trying to resolve conflicts." Sarah McCaffrey, one of Welter's former graduate student instructors, pointed to Welter's talent for using humor and his willingness to play devil's advocate in his classes. "He is extraordinarily effective at drawing out students and getting the whole class engaged in discussion," she said. "With over 100 students, this is no mean feat." 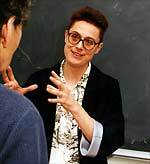 "As a teacher, you have the potential to really affect somebody's life," said Welter, who began teaching at San Diego State University before coming to UC Berkeley in 1984. "I've had students come up to me and say, 'I never thought about any of these issues before. You've really changed the way I think about the world.' That's worth a fortune." Welter's teaching skills go beyond the classroom to field work with farmers. His research in plant-insect interactions has helped farmers reduce the use of pesticides for their crops. "I tell my students that, with entomology, they have the potential to impart great societal value in near future terms," said Welter. His work has not gone unnoticed by peers such as Louise Fortmann, professor of forestry and sustainable development at UC Berkeley. "We need more teachers and mentors like professor Welter if we are going to save the planet," she said. In the fall, departments throughout the campus nominate outstanding faculty members for the Distinguished Teaching Award. The Committee on Teaching of the Berkeley Division of the Academic Senate then spends several months reading recommendation letters, student evaluations, and other supporting material, as well as visiting each nominee's class. Awardees each receive a certificate and $10,000 from UC Berkeley, as well as a gift from the California Alumni Association. More information about the Distinguished Teaching Award and its current and past recipients is available at http://teaching.berkeley.edu.